Bel boweth down, Nebo stoopeth, their idols were upon the beasts, and upon the cattle: your carriages were heavy loaden; they are a burden to the weary beast. They stoop, they bow down together; they could not deliver the burden, but themselves are gone into captivity. Hearken unto me, O house of Jacob, and all the remnant of the house of Israel, which are borne by me from the belly, which are carried from the womb: And even to your old age I am he; and even to hoar hairs will I carry you: I have made, and I will bear; even I will carry, and will deliver you. To whom will ye liken me, and make me equal, and compare me, that we may be like? They lavish gold out of the bag, and weigh silver in the balance, and hire a goldsmith; and he maketh it a god: they fall down, yea, they worship. They bear him upon the shoulder, they carry him, and set him in his place, and he standeth; from his place shall he not remove: yea, one shall cry unto him, yet can he not answer, nor save him out of his trouble. Remember this, and shew yourselves men: bring it again to mind, O ye transgressors. Remember the former things of old: for I am God, and there is none else; I am God, and there is none like me, Declaring the end from the beginning, and from ancient times the things that are not yet done, saying, My counsel shall stand, and I will do all my pleasure: Calling a ravenous bird from the east, the man that executeth my counsel from a far country: yea, I have spoken it, I will also bring it to pass; I have purposed it, I will also do it. AMONG THE ASTOUNDING AND FORBIDDING images of the Kilauea eruption on the Big Island of Hawaii, there is a striking photo of lava advancing on a row of leafy branches, stuck into a crack in a pavement so that they look like a row of soldiers about to be overwhelmed by an enemy army. These are ti leaves, and the Associated Press identifies them as a “sacred offering” to Pele, a goddess associated with fire and volcanoes. In 1986, during another Kilauea eruption, a UPI reporter noticed a similar detail. Ti plants (also called ki) have had many uses in Hawaii over time. They’re made into skirts, coats, and shoes; they’re woven into leis and used in thatched roofs. They’re wrapped around fish or meat and used as medicine. 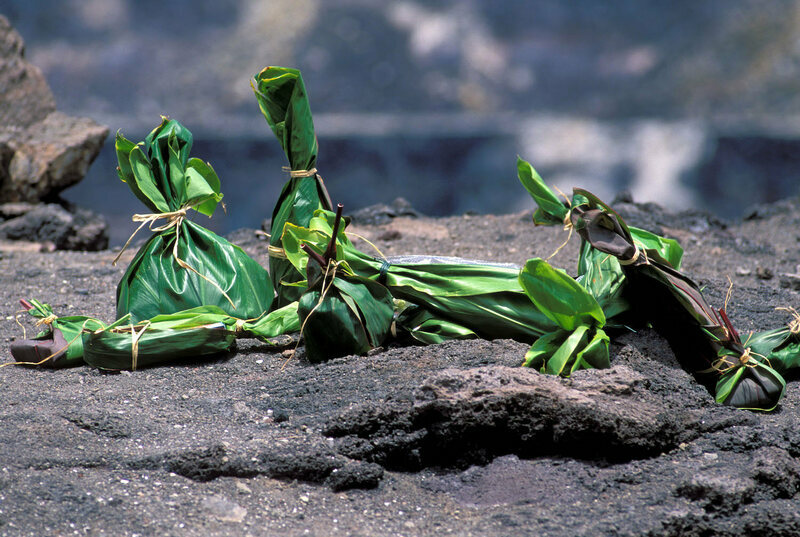 Sometimes, ti leaves are associated with protection from volcano-related dangers. One anthropologist in the 1920s observed ti leaves being used to shield a woman visiting a volcano, and ti leaves were carried by people performing the feat of walking on still-hot lava. But over their long history in Hawaii (they’re thought to be “canoe plants,” brought to the islands with settlers from Polynesia), ti leaves have come to be thought of, more generally, as a plant that offers protection. They’re often used to keep away evil spirits. The anthropologist was told that ti leaves were laid under bed mats for this reason; some people believe the plants can contain vengeful spirits in their graves. Traveling with pork can attract “angry spirits,” too, and the leaves offer some protection. One of the more common ways to use ti leaves for protection is to plant them around your house. Hundreds of people have had to evacuate the area where the volcano’s lava is flowing, and in four days, the eruption destroyed 35 homes and other buildings. For people hoping that their houses will survive, anything that could offer extra protection could be worth a try.